State Route 65 is a vital inter-regional route that serves both local and regional traffic, and is a major connector for both automobile and truck traffic between the I-80 and SR 70/99 corridors. Having been planned for three decades, the Lincoln Bypass was originally proposed to address the growing traffic conflicts and congestion resulting from a major interregional state highway bisecting the heart of the City of Lincoln’s downtown area. This area includes seven traffic signals, a junction with SR 193, and is paralleled by Union Pacific railroad tracks to the west. 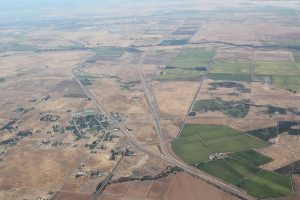 As far back as the late 1960’s and early 1970’s, the need for a bypass around downtown Lincoln was identified in planning documents such as the Placer County General Plan. Exponential growth in residential, commercial, and industrial development in and around the City caused congestion to worsen on SR 65 beginning in the 1990’s. Gridlock conditions were projected for SR 65 by 2025 without the Bypass in place. accident rates estimated at 30 percent higher than the statewide average for a similar type of facility. promoting a more pedestrian friendly environment in downtown Lincoln. create average speeds of 55 mph compared to 13 mph projected for 2025 without it. Free flow speeds will be created and maintained at 45 mph on the previous SR 65 alignment through downtown Lincoln. removes previous disruption and division of established areas such as downtown Lincoln by improving access to commercial and community services. The project improves reliability for goods movement delivery along a major connection for freight distribution and commercial truck operations, including connections at the Lincoln Regional Airport. The Lincoln Bypass reduces variance in delivery schedules and minimizes economic loss to shippers due to congestion. The project removes a significant amount of truck traffic out of downtown Lincoln. Over 14 percent of current traffic on SR 65 is comprised of trucks in some areas, about half of which is five or more axle vehicles. Before construction of the Lincoln Bypass, accident rates were estimated at 30 percent higher than the statewide average for a similar type of facility. 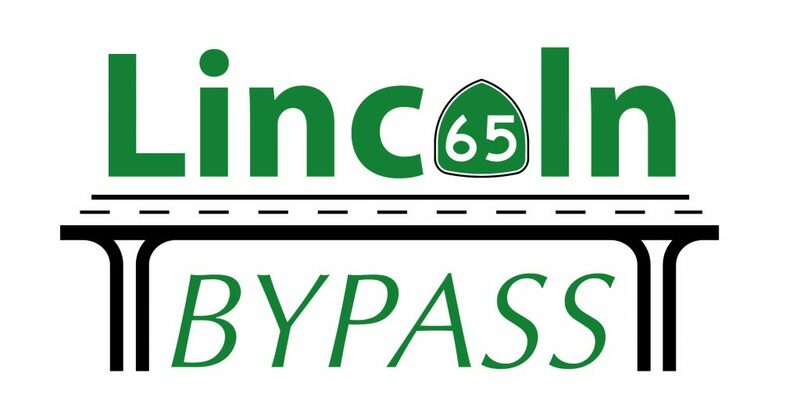 Estimates show that the Lincoln Bypass will result in a 14 percent and 17 percent reduction of fatal and injury accidents, respectively, and $15.6 million in accident cost savings over 20 years. 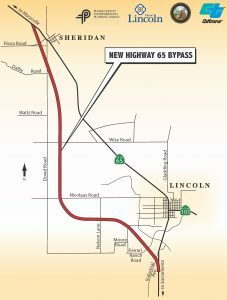 The Lincoln Bypass removes a high percentage of traffic out of an existing 100-year floodplain where the previous SR 65 alignment existed. Emergency response times are anticipated to drastically improve along SR 65 as a result of the project. Sheridan residents are experiencing increased safety in their community by having a signalized intersection with SR 65 at Riosa Road. The large overpass that crosses the Union Pacific railroad tracks south of Lincoln provides expansive panoramic views from the roadway including visual elements such as the City of Lincoln, pastureland, creek corridors, oak woodlands, the Sierra Nevada mountains, the Sutter Buttes, and the Coast Range. All bridges were designed and built to complement existing landscape through color, size, form, texture and aesthetically pleasing architectural design. Landforms were blended into bridge abutments to maintain visual continuity for the motorist. Soundwalls were provided where homes and other noise-sensitive properties are close to the right-of-way. Attractive colors and creative design provide visual enhancements for both the motorist and property owners. The color themes and patterns were carefully selected in collaboration with the City of Lincoln to resemble and reflect on the City’s clay reserves and clay products manufacturing history. All slope treatments were blended with existing features, simulating natural forms. This consisted of rounding the top and edges of the cuts and fills to present a softer transition line between constructed and existing slopes. An extremely strong partnership between the Placer County Transportation Planning Agency (PCTPA), the South Placer Regional Transportation Authority (SPRTA), Caltrans, the California Transportation Commission (CTC), the City of Lincoln, and Placer County was required to overcome the many obstacles that could have prevented the Lincoln Bypass from being built. Much of the partnership centered around balancing project components with funding, particularly as the project cost estimates rose with the heady economic times of 2002 – 2006. The team met for day-long sessions at times to figure out how to maintain the project integrity and keep within budget. A Memorandum of Understanding was developed and adopted by all parties in 2003 to delineate how each partner would contribute should project costs go up or down. For example, the City of Lincoln volunteered to provide fill dirt from the construction of a wastewater treatment plant to reduce the costs to the Bypass.The South Placer Regional Transportation Authority agreed to add another $10 million to the developer fee program to fund the Bypass. More importantly, at every turn, all team members looked at construction requirements and phasing to see if they were really needed, as a way to keep the project alive. By the end of the construction process, the team expanded to the construction contractor to all work together to coordinate the Grand Opening of the Lincoln Bypass – a festive, fun community event that meshed with the final construction activities. The result was a major event attended by hundreds of local residents, as well as the actual opening of the Bypass to cars happening ahead of schedule. 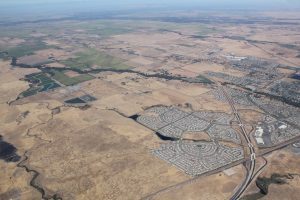 Without the luxury of a transportation sales tax in Placer County to help fund large transportation projects, PCTPA took the initiative along with Placer County, the Cities of Lincoln, Rocklin, and Roseville to form the South Placer Regional Transportation Authority (SPRTA) in 2001. SPRTA, administered by PCTPA, adopted a regional traffic impact fee to help fund regional transportation projects, including the Lincoln Bypass. In 2002, PCTPA brokered a deal with Caltrans and the California Transportation Commission to leverage the Placer region’s future shares of the STIP, along with SPRTA and other local funds, with Caltrans discretionary ITIP funds to fully fund construction of the Lincoln Bypass. 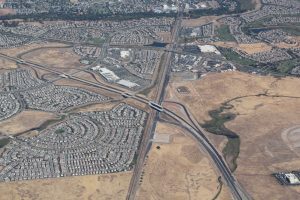 Not without great risk, this move allowed the project to move forward during difficult economic times and proved just how important the project is to Placer County and its residents. The project costs did not stay at the original $206 million estimate. By 2006, the total cost had climbed well to around $324 million. This is where a lot of innovative thought came in. Early placement of fill dirt from the wastewater treatment plant on the future right of way saved tens of millions of dollars and at least one year of compaction time. Early acquisition of right-of-way through SPRTA also saved significant escalation in acquisition costs. Purchase of the Aitken Ranch mitigation property early in the process also saved on rapidly escalating costs. Required park-and-ride lot funding came through local shares of Congestion Mitigation and Air Quality funds. The CTC, seeing all this local effort and commitment, again stepped up to the plate with Proposition 1B Corridor Mobility Improvement Act funds to make the project whole and push towards construction. By the time the project was ultimately bid in 2008, construction costs had declined with the economy, meaning that we were able to reap savings to add scope back into the project – just as was outlined in the Memorandum of Understanding adopted in 2003. All told, there were at least 10 sources of funding – from local impact fees to STIP and Proposition 1B to federal earmarks – used to make the Lincoln Bypass a reality.